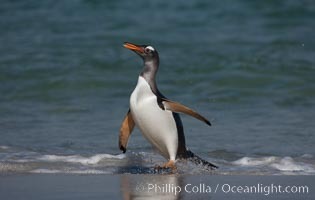 Gentoo penguin coming ashore, after foraging at sea, walking through ocean water as it wades onto a sand beach. Adult gentoo penguins grow to be 30" and 19lb in size. They feed on fish and crustaceans. Gentoo penguins reside in colonies well inland from the ocean, often formed of a circular collection of stones gathered by the penguins. Gentoo penguin, Pygoscelis papua Photo. 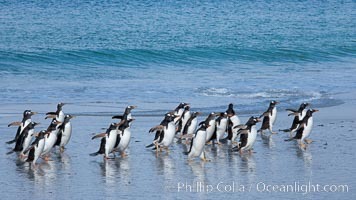 Gentoo penguins coming ashore, after foraging at sea, walking through ocean water as it wades onto a sand beach. Adult gentoo penguins grow to be 30" and 19lb in size. They feed on fish and crustaceans. Gentoo penguins reside in colonies well inland from the ocean, often formed of a circular collection of stones gathered by the penguins. Gentoo penguin, Pygoscelis papua Picture. 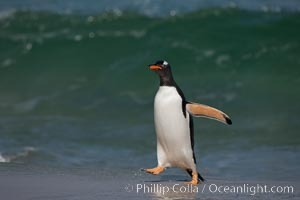 Gentoo penguin coming ashore, after foraging at sea, walking through ocean water as it wades onto a sand beach. Adult gentoo penguins grow to be 30" and 19lb in size. They feed on fish and crustaceans. Gentoo penguins reside in colonies well inland from the ocean, often formed of a circular collection of stones gathered by the penguins. Stock Photography of Gentoo penguin, Pygoscelis papua. 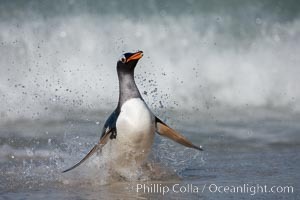 Gentoo penguin coming ashore, after foraging at sea, walking through ocean water as it wades onto a sand beach. Adult gentoo penguins grow to be 30" and 19lb in size. They feed on fish and crustaceans. Gentoo penguins reside in colonies well inland from the ocean, often formed of a circular collection of stones gathered by the penguins. 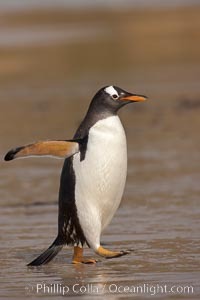 Photograph of Gentoo penguin, Pygoscelis papua. 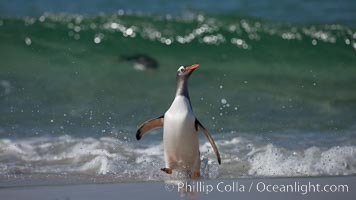 Gentoo penguin coming ashore, after foraging at sea, walking through ocean water as it wades onto a sand beach. Adult gentoo penguins grow to be 30" and 19lb in size. They feed on fish and crustaceans. Gentoo penguins reside in colonies well inland from the ocean, often formed of a circular collection of stones gathered by the penguins. Gentoo penguin, Pygoscelis papua Photos. 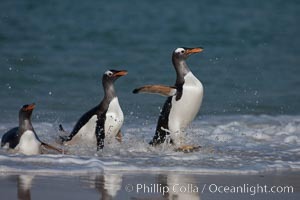 Gentoo penguins coming ashore, after foraging at sea, walking through ocean water as it wades onto a sand beach. Adult gentoo penguins grow to be 30" and 19lb in size. They feed on fish and crustaceans. Gentoo penguins reside in colonies well inland from the ocean, often formed of a circular collection of stones gathered by the penguins. Gentoo penguin, Pygoscelis papua Image. 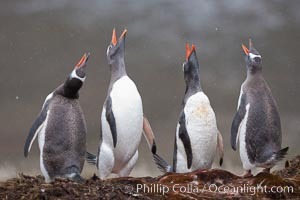 Gentoo penguins, calling, heads raised. 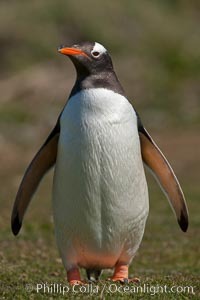 Professional stock photos of Gentoo penguin, Pygoscelis papua. Gentoo penguin walking through tall grass. Pictures of Gentoo penguin, Pygoscelis papua. 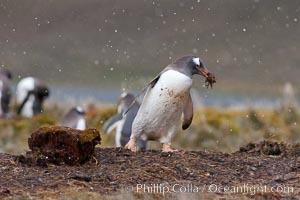 Gentoo penguin stealing nesting material, moving it from one nest to another. Gentoo penguin, Pygoscelis papua Photo. Gentoo penguins, permanent nesting colony in grassy hills about a mile inland from the ocean, near Stromness Bay, South Georgia Island. Gentoo penguin, Pygoscelis papua Picture. 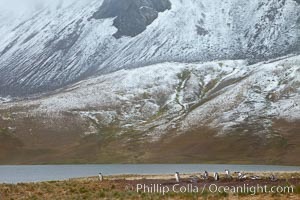 Gentoo penguins nesting beside a lake, snow-covered South Georgia mountains in the background. 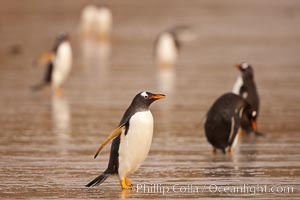 Stock Photography of Gentoo penguin, Pygoscelis papua. 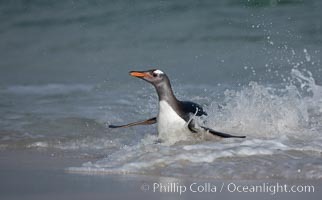 Gentoo penguin coming ashore, after foraging at sea, walking through ocean water as it wades onto a sand beach. Adult gentoo penguins grow to be 30" and 19lb in size. They feed on fish and crustaceans. Gentoo penguins reside in colonies well inland from the ocean, often formed of a circular collection of stones gathered by the penguins. Gentoo penguin, Pygoscelis papua Image. 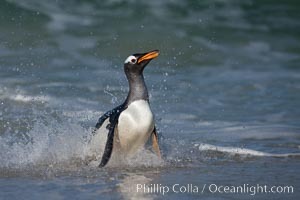 Gentoo penguin coming ashore, after foraging at sea, walking through ocean water as it wades onto a sand beach. Adult gentoo penguins grow to be 30" and 19lb in size. They feed on fish and crustaceans. Gentoo penguins reside in colonies well inland from the ocean, often formed of a circular collection of stones gathered by the penguins. 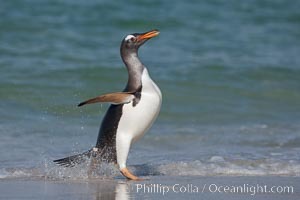 Professional stock photos of Gentoo penguin, Pygoscelis papua. 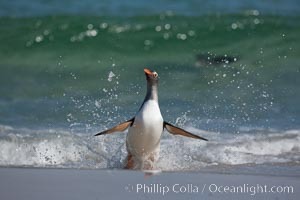 Gentoo penguin coming ashore, after foraging at sea, walking through ocean water as it wades onto a sand beach. Adult gentoo penguins grow to be 30" and 19lb in size. They feed on fish and crustaceans. Gentoo penguins reside in colonies well inland from the ocean, often formed of a circular collection of stones gathered by the penguins. Pictures of Gentoo penguin, Pygoscelis papua. 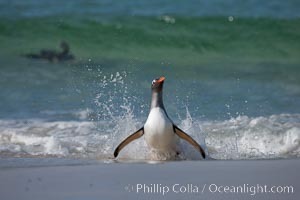 Gentoo penguin coming ashore, after foraging at sea, walking through ocean water as it wades onto a sand beach. Adult gentoo penguins grow to be 30" and 19lb in size. They feed on fish and crustaceans. Gentoo penguins reside in colonies well inland from the ocean, often formed of a circular collection of stones gathered by the penguins. Gentoo penguin, Pygoscelis papua Picture. Gentoo penguin. 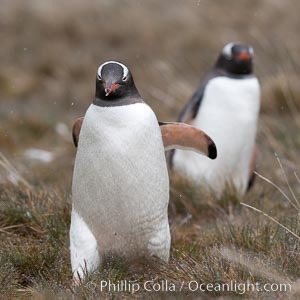 Gentoo penguins reach 36" in height and weigh up to 20 lbs. 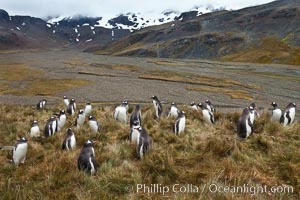 They are the fastest swimming species of penguing, feeding in marine crustaceans and fishes. Gentoo penguin, Pygoscelis papua Image. 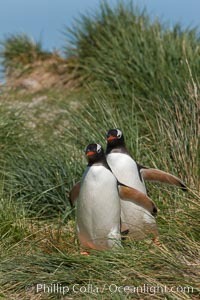 Gentoo penguins walk through tussock grass. 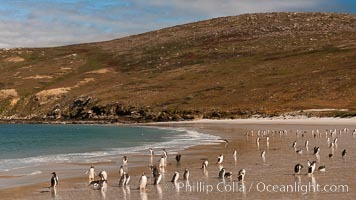 After foraging in the ocean for food, the penguins make their way to the interior of the island to rest at their colony. 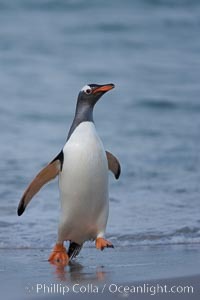 Professional stock photos of Gentoo penguin, Pygoscelis papua. 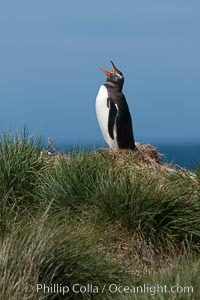 Gentoo penguin, vocalizing, atop of hill of tall tussock grass. Pictures of Gentoo penguin, Pygoscelis papua. 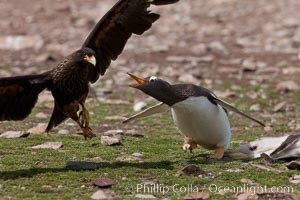 Gentoo penguin defends its dead chick (right), from the striated caracara (left) that has just killed it. The penguin continued to defend its lifeless chick for hours, in spite of the futulity and inevitabliityof the final result. Striated caracaras eventually took possession of the dead chick and fed upon it. Gentoo penguin, Pygoscelis papua Photo. 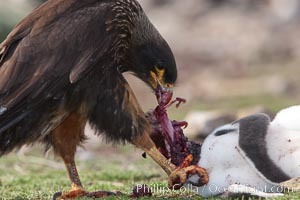 Striated caracara feeds upon a gentoo penguin chick it has just killed. Gentoo penguin, Pygoscelis papua Picture. Gentoo penguin walking through tall grass. 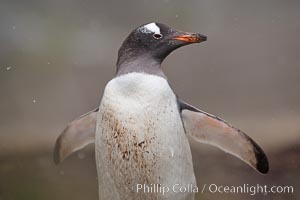 Stock Photography of Gentoo penguin, Pygoscelis papua. 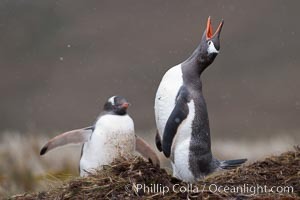 Gentoo penguin, calling, head raised, on the nest, snow falling. 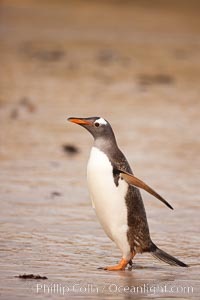 Photograph of Gentoo penguin, Pygoscelis papua. 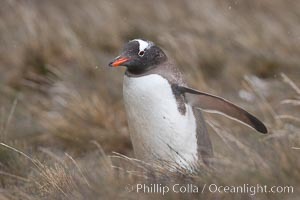 Gentoo penguin, walking through tall grass, snow falling. Gentoo penguin, Pygoscelis papua Photos. 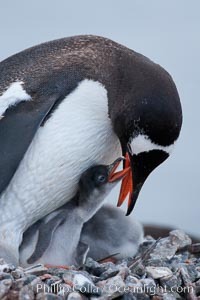 Gentoo penguin tending to its two chicks. The nest is made of small stones. Gentoo penguin, Pygoscelis papua Image.